The salmon in this dish is chock full of omega-3 fatty acids that research has linked to cardiovascular health, cell signaling and vitamin absorption benefiting many body systems including the heart, brain and skin. Combine all ingredients in a bowl and mix well. Makes 2¼ cups. 2. Combine the garlic, mustard, honey and pepper and brush on the salmon. 3. Cook the salmon for 15 to 20 minutes or until fish just flakes with a fork. 4. 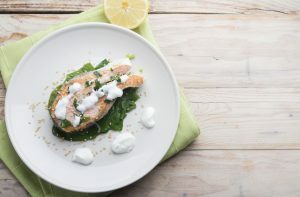 Serve each salmon fillet with three tablespoons of feta yogurt sauce. Nutritional information: Makes four servings. Serving size: 4 oz salmon & 3 Tablespoons feta yogurt sauce: Per serving: 337 calories; 14 grams total fat; 3 grams saturated fat; 258 milligrams sodium; 9 grams carbohydrate; 0 grams fiber; 42 grams protein.